The most powerful Verilog design environment -- for everyone! Makerchip is a free online environment for developing high-quality integrated circuits. 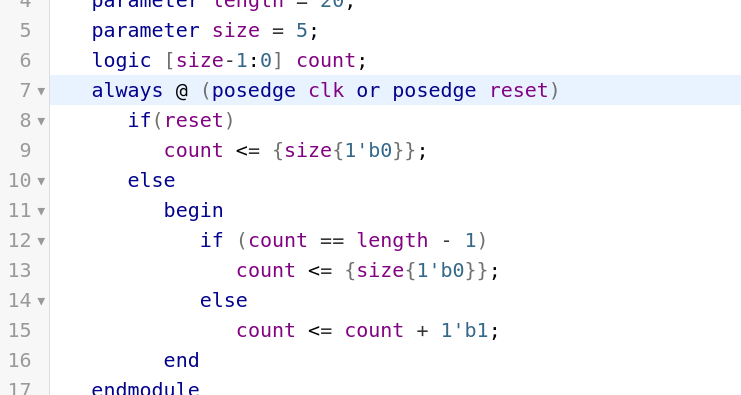 You can code, compile, simulate, and debug Verilog designs, all from your browser. Your code, block diagrams, and waveforms are tightly integrated. While Makerchip introduces ground-breaking capabilities for advanced design, it also makes circuit design easy and fun! Tutorials will get you going, so be among the first to experience a new era of circuit design! Did we say "easy" and "Verilog" in the same breath? That's just contradictory! That's why we've fully embraced the emerging Transaction-Level Verilog standard. Transaction-Level Verilog, or TL-Verilog, represents a huge step forward, by eliminating the need for the legacy language features of Verilog and by introducing simpler syntax. At the same time, TL-Verilog adds powerful constructs for pipelines and transactions. We'll help you learn it, and you'll never turn back! Instead of writing in Verilog always_ff @(posedge clk) begin ... to create flip-flops... don't write anything! Organize your Verilog logic statements into pipelines, and let TL-Verilog imply the necessary flip-flops. The code below provides a pipeline, called |incr containing pipeline stages @1, @2 and @3. Each stage increments the value from the previous stage by one in a subsequent clock cycle. Flip-flops (represented as grey squares in the diagram) carry values from one stage to the next. Pipeline context reduces bugs and makes your design easy to maintain in the face of timing changes. Learn more about TL-Verilog pipelines as well as other powerful constructs, including hierarchy, state, validity, and transactions in the TL-Verilog tutorials inside the Makerchip IDE. Waveforms are organized by TL-Verilog design hierarchy. Waveforms clearly show when signals are carrying meaningful data. Your designs are represented in logic diagrams. TL-Verilog design hierarchy, including pipelines and pipeline stages, provides organization to your logic diagrams. Below, the path through $ANY ovals shows the flow a transaction will follow through an example design. 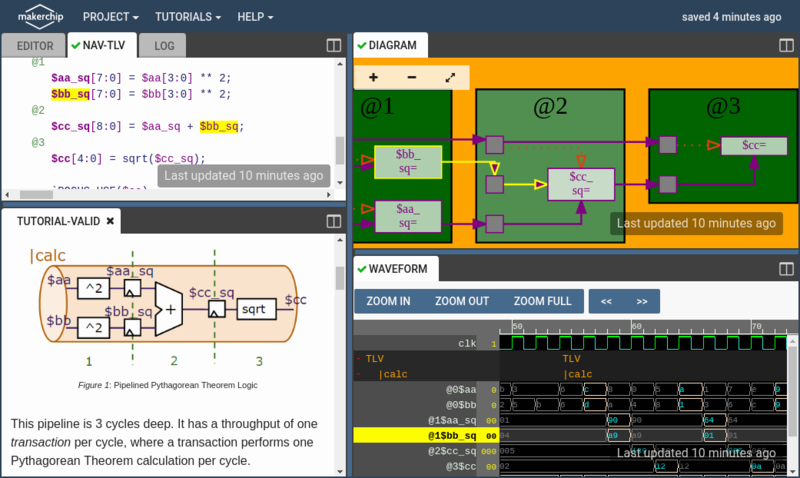 TL-Verilog constructs in the code editor, diagram, and waveform viewer are all linked together. Clicking an element such as a pipesignal in one view will highlight that element across all views. Interested in our tools commercially? Contact [email protected].